TJ Maxx and Marshall's have almost identical merchandise, so I went on a Paraben Free expedition to see what could be found. I only drop by about one a month since their product turnover is a bit slow. 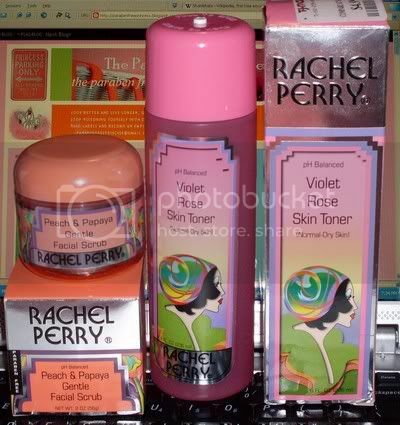 I picked up more Rachel Perry products. A couple of toners and another face scrub. Her products have really grown on me and the packaging is so unusual, it stands out. Perry products were $4 - $6 each, regularly $15 or so. I still see her older versions of these online and they do contain Parabens, so always check your ingredients. I also bought a 8 ouce Dani body lotion. They have several scents available, I picked Mango. Certified Vegan and Organic ingredients. Rachel Perry Perfectly Clear Toner: Ingredients: Active Ingredients: SD alcohol 40, Camphor, Eucalyptus Oil, Menthol, Peppermint Oil. Also Contains: Purified Water, Polysorbate 20, Echinacea, Panthenol(vitamin "B"), Comfrey Root (Allantoin), Sage Extract, Clove Oil, Irish Moss Extract, Citrus Oils, Essential Oil.